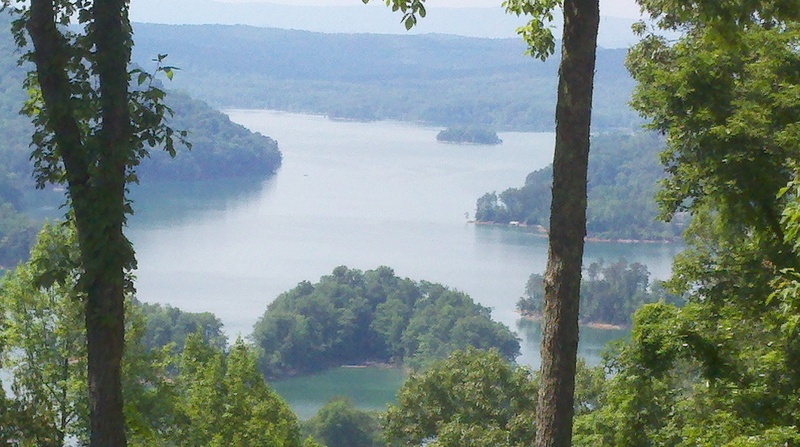 Mountain Top Log Home Care & Restoration is a leading provider of log home finishing, maintenance, restoration, and repair services based in Knoxville, TN. We are log home professionals trained specifically to work on a variety of log home, log siding, and cedar siding problems and needs. We’ve worked with the wonderful team at Honest Abe Log Homes for quite some time, and have developed a great relationship with them over the years. Recently, we had the privilege of working at the beautiful home of Nick and April Patterson, the owners of Honest Abe Log Homes. We could not be more proud of the work done at their house, and of the work we’ve done together over the years - here’s to many more! Another Magazine Cover for Mountain Top! Mountain Top Log Home Care and Restoration has been featured again in the March 2016 issue of Log Home Living. The same home that was featured in our Art of Finding Home Video was featured in last month's issue. Pick up a copy and read all about that cabin, and watch the video below to hear more about our role in the process! And contact us today if you're looking for someone to rescue your log cabin! Mountain Top featured in March 2016 issue of Log Home Living. Mountain Top Log Home Care and Restoration has been busy! In the past few months, we've been featured in two different articles in Honest Abe Living Magazine for some of our recent work. In the special Winter Edition of Honest Abe Living, Mountain Top's work on the Honest Abe Model Home in Crossville, TN is featured. Pete and the team finished and stained all of the interior and exterior logs on this cabin. The next edition of Honest Abe Living, the March-April 2015 Edition, features one of our favorite recent projects, the home of a cancer survivor. We are extremely proud of our work on this home, but you'll have to read the article to find out more :). At Mountain Top Log Home Care and Restoration, we are passionate about our work and the people we serve. If you would like to find out more about how we can serve you and your log home, don't hesitate to contact us today! Mountain Top featured in "Guardian Angel" article in March-April edition of Honest Abe Living. 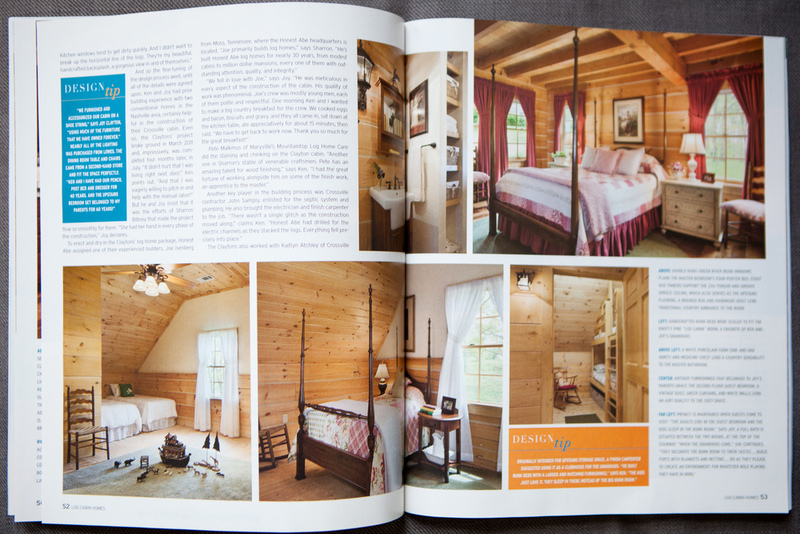 Mountain Top Log Home Care and Restoration was featured in the January 2014 issue of Log Cabin Homes Magazine. Here is an excerpt from the article, highlighting Pete and the team's role in creating a dream home for the cabin owners. "Pete Malkmus of Maryville's Mountaintop Log Home Care did the staining and chinking on the Clayton cabin. 'Another one in Sharron's stable of venerable craftsmen, Pete has an amazing talent for wood finishing,' says Ken. 'I had the great fortune of working alongside him on some of the finish work, an apprentice to the master.'" Mountain Top Log Home Care and Restoration is extremely honored and humbled to have been featured in this article, and we are thankful to have the chance to serve our home owners with our skills. These three videos show some of what goes on when we Media Blast a house. Make sure to contact Mountain Top Log Home Care and Restoration when you need to have your log home media blasted! My work takes me to some of the most amazing locations imaginable. It's a novice hobby of mine to take pictures of some of the beautiful things I see while I'm on the road. From time to time, I may add more pictures like these to document some of my travels. Enjoy! Prior to getting involved in log cabin restoration I owned a cable tv contracting company and later a marketing business where we did some health coaching and marketed mostly health and nutrition products along with some telecommunication services. I still market the nutritional products and do a little health coaching but I became interested in log cabin maintenance after watching my father struggle with his log cabin maintenance and in having a hard time in hiring credible, honest and competent contractors on the three log cabins he owned. "Because you have so little faith. I tell you the truth, if you have faith as small as a mustard seed, you can say to this mountain, 'Move from here to there and it will move. Nothing will be impossible for you." Proverbs 3:5 and 6 are also very important verses. "Trust in the Lord with all your heart and lean not on your own understanding; in all your ways acknowledge him and he will direct your paths." I often reflect on these words in needing God's help to solve some of the numerous, frustrating, tedeous problems that are usually associated in restoring a log cabin and in life in general. Over the years I have come to the understanding that if we trust in God he really does direct our paths. For me, it is equally important that God is directing the path of the customer as much as he is directing my path. Because of this, it is no surprise to me all of the incredible wonderful people that we have been privileged to have as customers over the years. I believe with all my heart that God is always allowing and orchestrating events in our lives to lead us into right relationship with him and with other people. Log cabin maintenance is about problem solving. We have excelled in the log home care and restoration business because we put the needs of the customer first and rely on God to give us the answers to the problems that we don't always have the answer to. Website and videos created by Stuart Jones Media.